Temperatures at Richmond, VA warmed to a high of 49° on Thursday (Feb. 18). This was the first time temperatures had been above 45° since January 28. The 20-day streak of temperatures below 45° was the 3rd longest in records which began in 1897. The longest was a 30-day stretch ending Feb. 9, 1966. Richmond's high today was 50°. With a low of 31°, the day was 0.5° above normal. Feb. 25 Update: The record was broken today. Evening Update: Although Pittsburgh's average temperature of 23.3° for February so far is 5.8° below normal, it's significantly higher than the 20.9° recorded in 2007. Only 14" of snow fell that month, a little over a third as much as this year. On the other hand, the average in January 1978, the current snowiest month, was 0.7° colder. That month, in turn, was over 11° warmer than the previous January, in which more than a foot less of snow fell. The monthly total so far is nearly 15" more than the old February record of 25.3" set in 2003. The long-term February average is 8.5". Snowfall records for Pittsburgh began in 1884. The National Weather Service forecasts the next chance of snow, other than snow showers, to be Sunday night Feb. 21 or Monday Feb. 22. Progress Update (Friday): After 5 days of perseverance and temperatures edging upward into the low 40s, meltwater is now virtually gushing through the downspout. 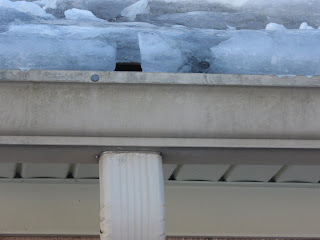 Note that there is still a solid ice bridge from the lower part of the roof across the top of the gutter, but the open channel in the lower part of the gutter is flowing freely with only minor dripping. Most of the runoff at this point is now from the upper roof, whose gutter is still heavily iced up but is too high to reach. One thing which also helps is that I got my roof rake on Wednesday. (Thank you Strosniders Hardware and Canadian ingenuity!) Even after about a week of settling and refreezing, it was still possible to carve away the snow, and I was able to clear the bottom half of the lower roof. This should significantly reduce the amount of remaining melting. Another point to remember is to clear a path from the bottom of the downspout or its extender pipe so the runoff can flow away from the house. This is especially important with at least some rain in the forecast for Monday. As many Mid Atlantic residents (and some in the South) are discovering, the excitement of an unusually heavy snowstorm can be quickly followed by the hangover of ice dams. 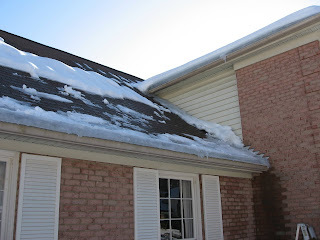 Especially when temperatures fluctuate above and below freezing, heating from the attic below and the sun above can produce melting snow which refreezes in gutters. The solid ice then prevents further meltwater from draining. 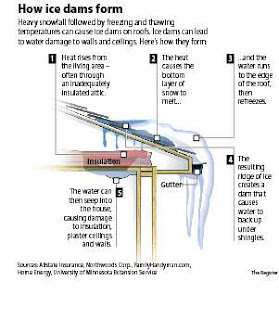 That water can then back up under shingles and behind soffits to leak into interior walls and ceilings. 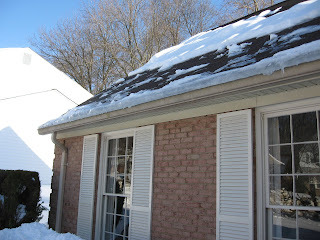 Suggestions in the media to prevent ice dams by increasing attic insulation or removing snow from the roof are certainly helpful for next year, but what can you do if they've already formed? (Roof rakes, which are apparently well known in more northern climes, are now all the rage here in the Washington metro area, but good luck trying to find a hardware store which has them in stock, and it's a little late to order online as that glacier on your roof becomes more solidified with each thaw/freeze cycle.) Another "helpful" suggestion is to rip down your gutters as a last resort if the water is flowing heavily inside your house. Under the frozen conditions, exactly how are you supposed to do that? Believe it or not, this north-facing, perpetually shaded, ice-laden gutter at the climate capitalist capitol (image to the right) is actually draining at a rate comparable to that of a spring shower. The temperature at the time the picture was taken was about 35°, and the high for the day was in the upper 30s. The way to accomplish this is to use some of the same natural forces that created the problem to help solve it. Clearly, you're not going to simply remove that entire mass of ice without some help. Water is almost as lazy as you are, so with a little bit of effort on your part, you can take advantage of that fact. According to the "theory of gravity", water wants to flow downhill. If you give it a suitable path, even a small one, it will continue to follow it. An assistant to stay inside and refill the watering can is also helpful. Because water wants to flow downhill, you need to start at the end of the gutter above the downspout. Carefully climb up with the watering can partially filled with hot water and position the end of its spout on the edge of the ice directly above the downspout. 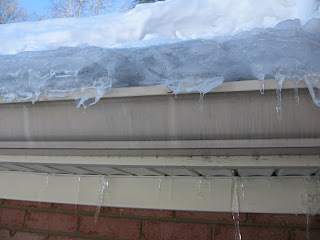 Since the ice is slippery and it only gets more so when water is applied, it's easiest to do this starting at the top edge of the front of the gutter. Keep the spout in position as you slowly pour the water onto the ice. You now have a kind of water-powered drill in action, with the hot water boring into the ice. Repeat application of the hot water until you've created enough of a hole for the spout to reach all the way to the downspout and water is flowing down it. Now that you have a way for the water to escape the gutter, you need to give it a path to reach the downspout. Set up the ladder at the far end of the gutter and repeat the melting process. As long as the gutter remains blocked, water will overflow the gutter. Some of it may also back up into the soffit and possibly get inside the wall seemingly adding to the problem, but it's better to have a little extra water overflowing now instead of a lot more later. 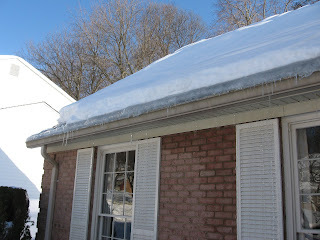 Eventually, the water will melt its way along the bottom of the gutter and create a path all the way to the downspout. You will be able to see this visually when water stops overflowing from the gutter, dripping from the soffit, or running off the uphill end of the gutter. You will even be able to hear it gushing down the downspout. Use boiling water instead of water from the hot water tap. Mix some de-icing salts in the water. Once you've created a big enough access hole through the ice, you can continue to apply de-icer by filling one leg of a pair of old pantyhose with de-icer, tying it off and inserting it into the hole to be dissolved by the water as it runs off. It's helpful to have the pantyhose secured with a string, so you can fish it out before it gets carried off to clog up the gutter or downspout. If temperatures drop below freezing at night, the water flow may again be blocked, so you'll probably need to reapply the hot water treatment for a few days until the melt process becomes self-sustaining. Once it's been started, however, it's much easier to get going again. If the roof is exposed to enough sunlight, the melting may succeed on its own within one or two days.